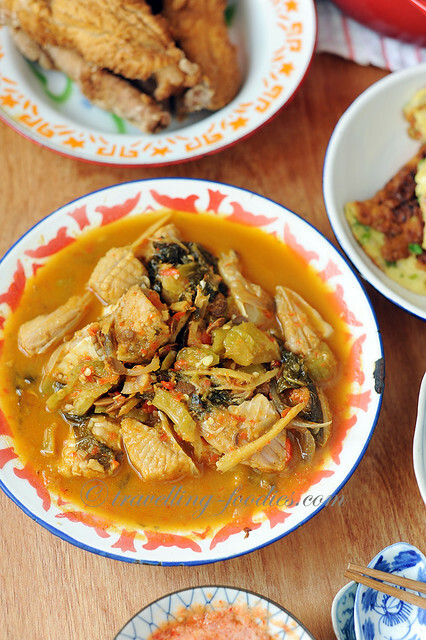 豆酱咸菜炒魟鱼 is a very classic Teochew way of cooking fish like stingray and shark. Yes we eat shark, which might sound as a surprise to some. We do not advocate the consumption of sharks’ fin because of the cruelty involved in the extraction of the fins but I have no problems with eating shark’s meat at all. That said, do note that sharks being a tertiary consumer in the food chain, would necessarily but subject to potential risks of bioaccumulation of heavy metals like mercury and lead. Hence, it is wise only to eat shark’s meat from reasonably young specimens. Stingray is also a good substitute for shark if one cannot overcome the psychological barrier of eating shark’s meat as both are cartilaginous types of fish. The challenge with purchasing stingray lies in determining the freshness of the meat. I have no qualms of placing the slab of meat near my nose for a whiff. It shouldn’t smell much if not at all if the fish is fresh. If it reeks of ammonia, the meat is already past its prime and would rapidly deteriorate hence forth. Also, I usually try to cook stingray on the same day it was freshly bought or at very best by the next day. Unlike some other species like cod and halibut which store well frozen, the meat quality of stingray also deteriorates with prolonged storage. My personal preference is to buy the cuts nearer to the “wings” which tend to look pale pink compared to those thicker cuts from the middle of the body which tend to look a deeper red. I was taught that the latter cuts tend to “go bad” and emit a foul smell more easily because of the higher concentration of blood circulating these areas compared to the terminal parts of the fish like the wings. Pound or blend red chilies with half of the peeled onion to form a coarse paste. Slice the other half of the onion into long strips. To a heated wok, add cooking oil and saute julienned ginger until fragrant. Add salted vegetables, onion-chili paste, onion strips, taucheo and minced garlic until fragrant. Add stingray pieces and stir fry to coat uniformly. Add sufficient water to make sure all the ingredients are just covered. Season with sugar, salt and pepper as required. Stir fry a bit to reduce and thicken the sauce slightly. 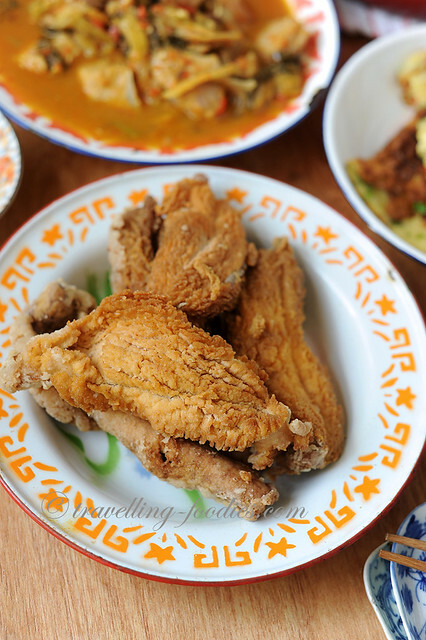 Goreng Telor Ikan aka Crispy Fried Fish Roe is a simple delicacy which is very easy to cook. The challenge in this dish lies with the procurement of fresh fish roe sacs which are not the easiest thing to find. I scored a really nice batch today and bought a plate from the fishmonger rather cheaply. Wasted no time in getting them home to prepare this simple yet super yummy dish. Carefully rinse the roe sacs over a weak running tap until the water runs clear. Place them in a plate and rub gently with salt and pepper and set aside to marinate for 10 min or so. Meanwhile get a wok of oil heated up to around 160C. Test by adding a small pinch of cornstarch into the oil and the cornstarch should start to fizzle slightly. The oil should not be smoking. Dredge the marinated roe sacs generously over a plate of cornstarch. Gently pat or shake off the excess flour to form just a thin coating. Wait for the cornstarch to be slightly absorbed and reconstituted by the residual moisture on the roe sac. This is a technique called “反潮” in traditional Chinese cooking and the purpose is to allow the flour to stick onto the surface of the fish roe better during the frying process. Gently slide the roe sacs into the heated oil and leave for 20-30 seconds. DO NOT attempt to stir or turn at this point which may cause the delicate fish row which is held by only a thin membrane to break open. While the surface of the roe sac begins to crisp up slightly and turn slightly brown, Turn and fry the other side. Use a spatula to gently push the hot oil over the surface of the roe sacs to ensure that it is uniformely cooked. Remove the roe sacs have nicely crisped up and turn golden brown. Serve immediately with a chili dip. 樱花虾菜脯蛋 is a twist to yet another Teochew classic, i.e. 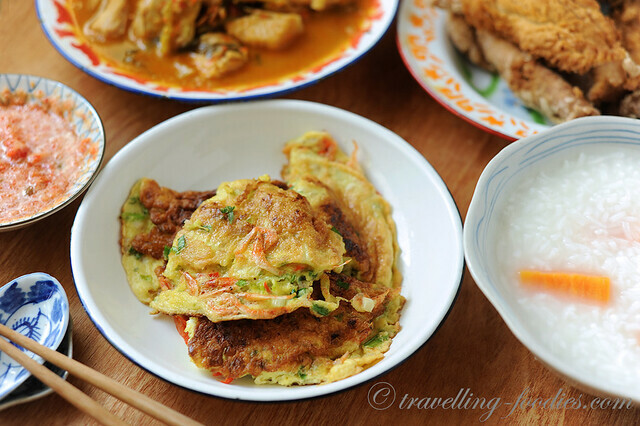 chye poh neng aka omelette with pickled radish bits which are packed with so much umami flavours. I’d added sakura ebi to give the flavour profile a boost and it worked really well. 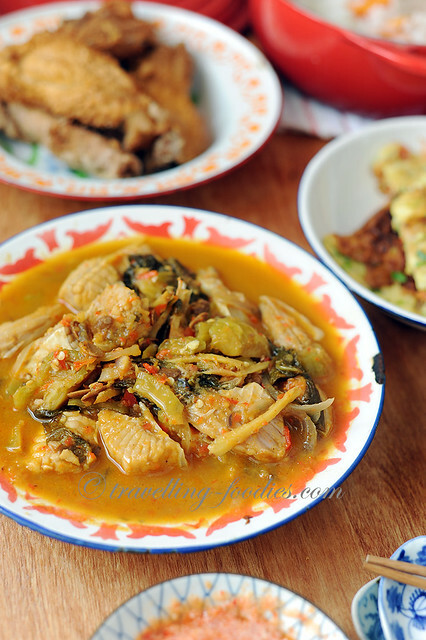 It is otherwise a really easy dish to cook also and goes really well with traditional Teochew porridge. Use a fork and whisk slightly to ensure that everything is well mixed. To a heated wok, add cooking oil and swirl gently to ensure the entire surface is well coated. Carefully pour the egg mixture into the wok and swirl around to spread it out. Sprinkle sakura ebi evenly over the top. Cover and cook for 2-3 min over medium low flame. When the top has almost dried up, toss to flip the omelette over to cook the other side which takes around 1 min or so to cook and crisp up slightly. 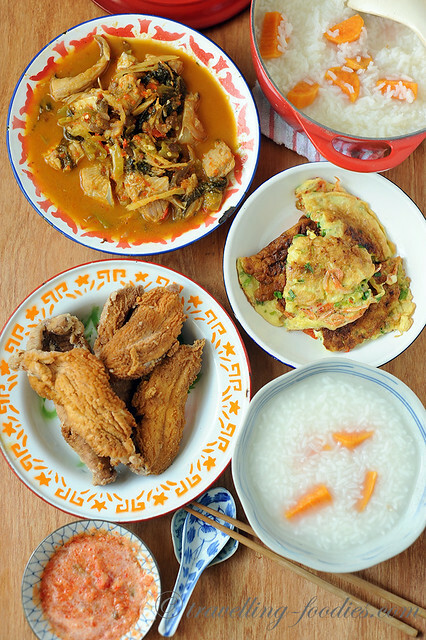 Dish up and serve immediately with Teochew porridge. ** do note that sweet chye poh is used. If the salty version is used, one may need to rinse them briefly in a fine wired sieve to remove excess salt. I like to cook the han tze muay 番薯糜, i.e. Teochew style sweet potato porridge while the dishes are being prepared. It helps to save time considerably though Teochew muay takes a much shorter time to cook as the grains remain largely whole and intact while the sweet potato is nicely soften. This entry was posted on April 12, 2018 by Alan (travellingfoodies). 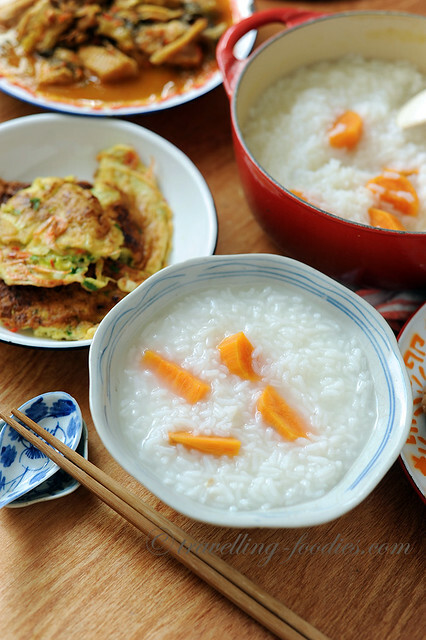 It was filed under Food, Simple Eats and was tagged with chinese porridge, fried fish roe sac, sweet potato porridge, teochew muay. nice posting of 清粥小菜. May i know which stall do you get your Nasi AMbeng from in Geylang Serai?